PRINCE2 Practitioner provides you with everything you need to know to apply the PRINCE2 methodology effectively to the way you manage your projects. Our classroom courses give you the opportunity to learn from, and engage with, trainers who are passionate and knowledgeable about their field. Our accredited two-day PRINCE2 Practitioner classroom course fully prepares you for the PRINCE2 Practitioner examination. The examination measures whether a candidate can demonstrate sufficient ability to apply and tailor PRINCE2 to the running and managing of a project. A successful Practitioner candidate should, with suitable direction, be able to start applying the method to a real project. This course conforms to the 2017 syllabus. This is a two day classroom course. In the USA the American Society for the Advancement of Project Management is the IPMA chapter; visit http://www.ipma-usa.org/. The ASAPM Level D certificate is their Certified Project Management Associate. To read the full AXELOS pre-requisite terms and conditions click here. Important : Please note you will require a copy of the official PRINCE2 2017 manual for the PRINCE2 Practitioner course and exam. This is not included in the cost of the course. Should you wish to purchase the manual you can add it to your shopping cart once you have selected your chosen date. There is mandatory online pre-course work that must be undertaken prior to attending this course. It is expected that it will take approximately six to eight hours to complete. You will be sent full instructions with a link to the online pre course within 48 hours of your confirmed booking. In addition, whilst attending your course there will also be some examination preparation evening work. What have others said about this course? The PRINCE2 Practitioner course was hard work but well worth it, with the interactive modules you can learn at your own pace and then the additional days in the class really bring it all together. You can really see how a project should be managed, and where you're going wrong, once you work through the modules which really fires your enthusiasm to do it right! I attended the PRINCE2 Practitioner Gold workshop just over six weeks ago and thought it was excellent, far exceeded my expectations and the trainer was brilliant. I learned so much during those two days and wouldn't be able to find fault even if I tried, it was the best training course I have attended. Pitched at the right level and to an excellent standard. A relaxed, informal environment that aided my learning! Well done Bill [the trainer]. How big does a project have to be before PRINCE2 can be used? PRINCE2 can be applied to all sorts of projects, from the very small to the very large. Even projects lasting only a few days will benefit from selective application of PRINCE2 guidelines. The key to success with PRINCE2 is to remember it is highly configurable, and so can be adapted for all project types regardless of industry and marketplace. What are the PRINCE2 qualifications and what will they teach me? The PRINCE2 Foundation qualification will teach you the PRINCE2 principles, terminology and when qualified you will be able to act as an informed member of a project management team using the PRINCE2 methodology within a project environment supporting PRINCE2.The PRINCE2 Practitioner qualification will teach you to apply PRINCE2 to the running and managing of a project within an environment supporting PRINCE2. Once qualified you will be able to apply and tune PRINCE2 to address the needs and problems of a specific project scenario. 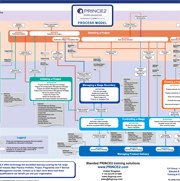 You will have a comprehensive knowledge of the relationships between the PRINCE2 principles, themes and processes and PRINCE2 products and will understand these elements.The PRINCE2 Re-registration qualification is designed for those who have passed PRINCE2 to Practitioner level and wish to maintain their Registered Practitioner status. The PRINCE2 Examination Board has determined that all PRINCE2 Practitioners should be re-registered within 3-5 calendar years of their original certification (failure to pass the Re-registration Examination after 5 calendar years as a Registered Practitioner will result in withdrawal of your registered status). What is the format of the PRINCE2 Practitioner exam?